A decadent and fudgy chocolate brownie with a delicious spiced pumpkin swirl. It’s the perfect fall dessert! This is a sponsored recipe on behalf of Antique Candle Works. To me, the first real sign of fall is when the pumpkin spice candles get lit. And you guys, I’ve found the best pumpkin spice candle in all of the land! Oh yes – Antique Candle Works just launched their newly improved Pumpkin Spice Candle and it is more pumpkin-y than ever! The only issue with their delicious Pumpkin Spice Candle is that it makes me crave the real thing. In this case, Pumpkin Swirl Brownies. 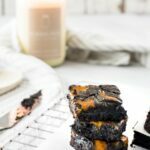 You are going to love these fudgy, spiced brownies as much as you love the candle. Trust me. This brownie is chocolatey and decadent but with a hint of fall spices and pumpkin. It’s a match made in heaven if I do say so myself. It’s also a really quick recipe to make which is just as well because they won’t last very long and you’ll be baking another batch before you know it! So light yourself a delicious candle, sit back with a decadent brownie and enjoy the season! A decadent and fudgy chocolate brownie with a delicious spiced pumpkin swirl. It's the perfect fall dessert! Lightly grease an 8-inch square baking pan with cooking oil spray. Line with parchment paper. Combine melted butter, oil and sugar together in a medium-sized bowl. Whisk well for about a minute. Add the eggs and vanilla. Beat until lighter in color (a full minute). This gives the nice crackly top. Sift in flour, cocoa powder and salt. With a wooden spoon or spatula, gently fold the dry ingredients into the wet ingredients until JUST combined. Do not over mix. Combine the pumpkin swirl ingredients in a bowl - stir together the pumpkin, sugar, egg yolk and pumpkin pie spice. Top the brownie batter with dots of the pumpkin swirl batter. Using a toothpick, swirl the mixtures together. Bake for 25 minutes, or until the centre of the brownies in the pan no longer jiggles and is just set to the touch (keeping in mind that the brownies will keep baking in the hot pan out of the oven).